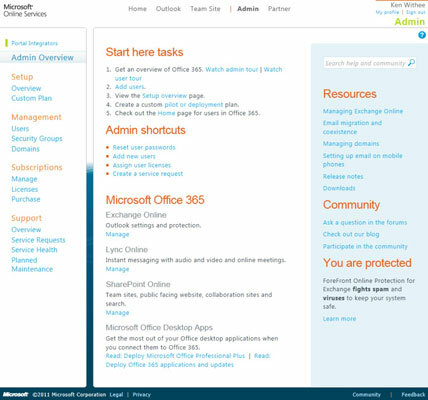 The management section for Exchange Online can be accessed by clicking on the Admin Overview link in the upper-left corner on the main Microsoft Office 365 administration page and then clicking the Manage link under the Exchange Online section. Depending on your level of access, you can choose to manage the entire organization, yourself, or another user. You select which you want to manage by using the drop-down menu at the top left of the screen. The Exchange Online management pages contain a tremendous number of configuration settings that could only fully be covered with a dedicated book on the topic. The following sections provide an overview to managing Exchange Online for yourself or your organization. The management pages for managing the organization include sections for managing users and groups, roles and auditing, mail control, and phone and voice. The Users & Groups section provides configuration options for managing users and groups. 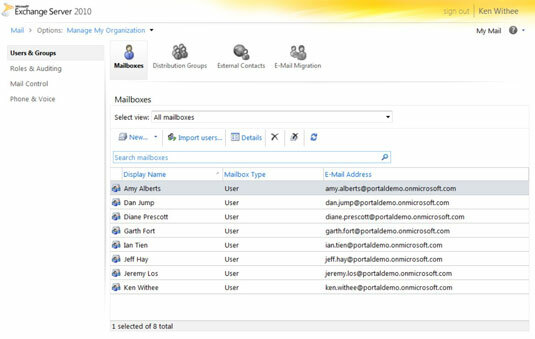 Buttons across the top of the page let you switch between managing user mailboxes, e-mail distribution groups, contacts that are external to your organization, and a wizard for migrating e-mail into the Exchange Online environment. The Roles & Auditing section provides the ability to manage user roles and administrative roles. You switch between the management screens by using the buttons at the top of the page. In addition, there is a button for auditing that provides a number of reports, such as determining the users that access a mailbox that is not owned by them, running a litigation hold report to determine the mailboxes that have a hold, and searching for administrative changes to roles and groups. The Mail Control page provides the ability to create rules, configure domains, journaling, and reports of e-mail delivery. 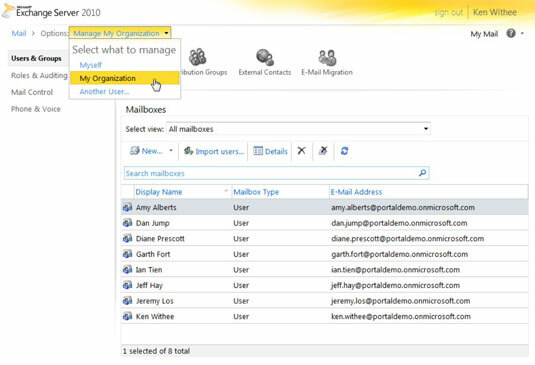 Rules let you control the flow of e-mail within your organization. For example, if an e-mail is sent to a mailbox such as info@portalint.com, then you can have a rule that forwards the e-mail to everyone within the support team. You can also configure domains and journaling. Configuring domains allows you to accept e-mail for specific domains, such as portalint.com. Configuring Journaling lets you record e-mail communications in support of e-mail retention or archiving policies. This functionality is critical for highly regulated industries, such as banking. Finally, you can use delivery reports to search for specifics on e-mail communication, such as messages with certain keywords or from a specific person. The Phone & Voice page enables you to configure unified messaging that connects your phone system with the rest of the Office 365 services. Using the Phone & Voice page, you can connect Exchange Online to your phone system that includes mobile phones and office phones. The end result is that your physical telephone system becomes an integrated extension of the Office 365 product. 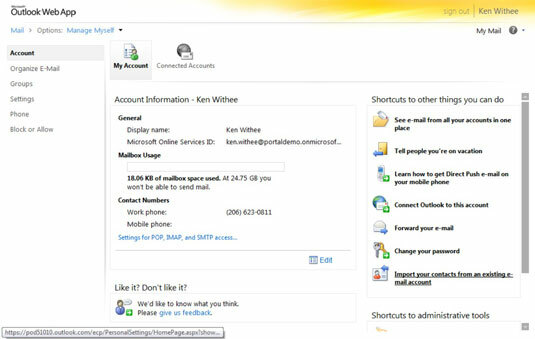 You also have the ability to manage personal settings by selecting to either manage yourself or manage another user’s mailbox from the drop-down menu at the top of the Exchange Online management screen. By using the personal management screen, you can set settings for your mailbox, such as your account information, your e-mail groups, your phone settings, and the e-mail you want to block or allow into your mailbox. In addition, you can connect external accounts so that you can view e-mail from other systems and organize your e-mail by creating rules for auto replies, retention policies, and delivery reports. You can accomplish the configuration on the personal settings pages.